When you’re camping, sometimes you don’t have access to safe, drinkable water. That’s why it’s important to pack your own, and plenty of it. Don’t forget that you’ll probably also want water to wash dishes and hands, and brush teeth with, so pack extra. Remember that it’s not safe to drink from most lakes or ponds, and even fast flowing rivers can have bugs and contaminants that aren’t safe to drink, so keep yourself healthy and just pack your own water. Even if you’re just going for a day, you’ll want to pack food too. 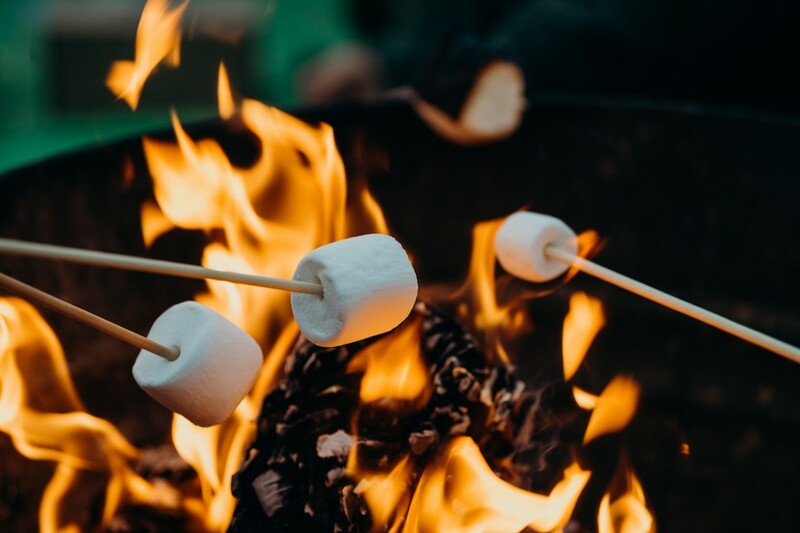 First of all, there’s nothing better than a toasty fire-roasted marshmallow, and second, you’ll have to eat something for sustenance. Be sure to pack your food safely, separating cooked and raw foods, and keeping any raw meats well refrigerated in an insulated cooler. This will ensure you don’t run into any issues with food poisoning. If you plan on using a lantern, cookstove, grill, or any other appliance that runs on flammable fuels like gas or kerosene, make sure you’re only using them in the great outdoors. Fuels like these put out a lot of carbon monoxide, and if used in an enclosed space, could cause carbon monoxide poisoning. Be sure to bring an open-sided tent or hang a tarp in case it rains, because it’s not safe to bring your fuel-run appliances into your tent or living space. Camping brings us closer to nature, and that includes wild animals. Do plenty of research to see what potential wild animal encounters you can expect near your campsite, and read up on how to deal with each animal. Be sure to hang food and trash from a tree far from your campsite if you’re in an area with bears, and keep your family pets on a short leash if you plan on doing a lot of hiking. Unfortunately, dogs tend to attract wildlife, and the last thing you want is a snake bite or a skunked pup on your family camping trip. Keeping healthy on camping trips is really important, especially in the heat of the summer, and the cool temps of the fall. Temperature-related illnesses like heat stroke and hypothermia are especially dangerous on camping trips, because you may not be close to a hospital or doctor to get help. It’s important to pack plenty of warm clothes and cold-weather rated sleeping bags for trips when the nights get chilly. Conversely, when camping in the heat of the summer, be sure to pack plenty of sunscreen, water, and take regular breaks in the shade when you’re hiking and hanging in the sun. These precautions will keep you and your family much safer from heat stroke and hypothermia while you’re out in the elements. The most important item in anyone’s camping pack is a first aid kit. It should be full of bandaids, antibiotic ointment, allergy pills, bandages, rubbing alcohol, and a number of other useful items in case someone has an issue on the trails. Be sure your first aid kit is easy to locate, and well-organized so you can find exactly what you need in no time flat. It’s also a good idea to check with your insurance provider to see which local medical facilities accept your health insurance, just in case something unexpected happens. A little bit of research now can save you a lot of money in the event that someone is injured while you’re camping. Especially if you plan on taking a longer trip, it’s worth doing a bit of research on the area to see where your health insurance provides coverage. Camping trips are always a little extra fun when you bring your recreational vehicles along. Whether you’ve got an ATV or a dirt bike, you’ll want to make sure you’ve got the appropriate insurance so you can ride easy knowing your vehicles are covered. Same goes for the RV campers heading out on some of those long summer camping trips later this year. Before you hit the road, make sure you’ve got all the insurance you need to have a great time. If you need insurance for your ATV, RV, or four wheeler, give Doyle & Ogden a call. We’ll get you better coverage for the right price, so you can have the summer camping trip you’ve been dreaming about all winter, without any worries. Give our office a call at 616-949-9000 or request a free quote online today!